This easy cream biscuits from Natalie Dupree, made with just self-rising flour and cream, are so simple even a beginner can make them. What is White Lily Flour? 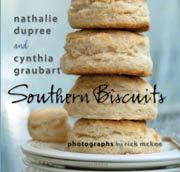 An intrepid recipe tester of ours, Eydie Desser, recently had the good fortune of chatting with the lovely Nathalie Dupree about this very cream biscuits recipe, which comes from Dupree’s recent cookbook, Southern Biscuits. Nathalie imparted many words of biscuit-minded wisdom in response to Eydie’s questions, including the fact that she prefers to work with White Lily, a Southern belle of a flour that boasts a relatively low gluten content and, as a result, invariably turns out biscuits that are lighter and fluffier than anything made with standard-issue flours. If you aren’t able to find White Lily (or another self-rising, low-gluten Southern flour such as Martha White or Midstate Mills), continued Nathalie, you can substitute an equal measure of self-rising cake flour and the results will be close to indistinguishable. Even if all you have available to you is standard-issue self-rising flour, simply scale back on the amount of flour in this recipe by two tablespoons and your biscuits will mimic those made with White Lily. Neat-o, yes? 1. Preheat the oven to 450°F (232°C). Adjust the oven rack to one of the top positions, setting the rack one shelf above the middle shelf, but not so close to the top of the oven that the biscuits will bump into it as they rise. 2. For a soft exterior, select an 8- or 9-inch cake pan, pizza pan, or ovenproof skillet. The biscuits will nestle together snugly, helping each other stay tender but rise while baking. Brush the pan with butter. For a crisp overall exterior, select a baking sheet or large baking pan where the biscuits can be spaced wide apart, allowing air to circulate and creating a crisp exterior. Brush the pan with butter. 3. Fork-sift or whisk 2 cups of the flour in a large bowl. Make a deep hollow in the center of the flour with the back of your hand. Pour 1 cup of cream into the hollow and stir with a rubber spatula or large metal spoon, using broad circular strokes to quickly pull the flour into the cream. Mix just until the dry ingredients are moistened and the sticky dough begins to pull away from the sides of the bowl. If there is some flour remaining on the bottom and sides of the bowl, stir in 1 to 4 tablespoons of the reserved cream, just enough to incorporate the remaining flour into the shaggy, wettish dough. If the dough seems too wet, use more flour when shaping. 4. Lightly sprinkle a cutting board or other clean surface with some of the reserved flour. Turn the dough out onto the board and sprinkle it lightly with flour. Flour your hands and then fold the dough over in half. 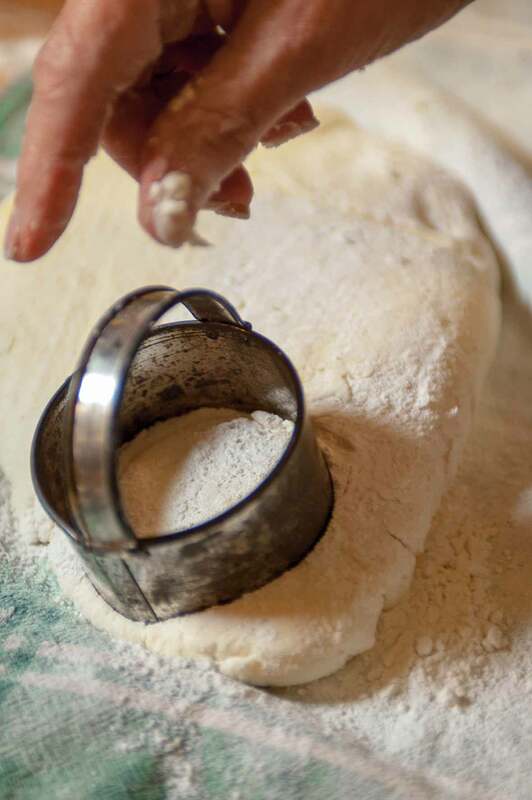 Pat the dough into a round about 1/3- to 1/2-inch-thick, using a little additional flour if the dough is sticky. Fold the dough in half a second time. If the dough is still clumpy, pat and fold it a third time. 6. Using a metal spatula, move the cream biscuits to the pan or baking sheet. Bake the biscuits for 6 minutes, then rotate the pan so the front is now turned to the back. If the bottoms are browning too quickly, slide another baking pan underneath to add insulation. Continue baking another 4 to 8 minutes until the cream biscuits are lightly golden brown. When the biscuits are done, a total of 10 to 14 minutes, remove from the oven and lightly brush the top of the biscuits with softened or melted butter. Turn the biscuits out upside down on a plate to cool slightly. Serve hot, right side up. This is a fabulous recipe for perfect biscuits in a snap—it only has two ingredients! I couldn’t find the self-rising version of White Lily flour, so I added 3 teaspoons of baking powder and 1 teaspoon of salt. With the full 4 tablespoons of cream, the dough was extremely easy to work with. I didn’t use any shaggy or clumpy parts of the dough, and after folding twice, it was perfect—soft but not sticky. Voila! Eleven minutes later, we had hot, flaky biscuits. It was with great trepidation that I entered Nathalie’s kitchen almost two years ago to start working on this book. I, a Southerner, had never made a biscuit. The thought of cutting in fats, kneading, snapping the dough, rolling, and hand-shaping just scared me to death. (Fear of failure, I suppose.) But, these biscuits changed everything. Easy, fast, and practically foolproof, they come together in a snap and are so delicious, you’ll be tempted to pop them straight from the oven and into your mouth. Two things to remember: (1) when using the biscuit cutter, cut straight down without twisting. When you twist the cutter in the dough, it seals the edges of the biscuit and prevents a good rise. (2) Fold the dough over at least twice. It helps with the rise, creates layers, and makes the biscuit easier to split open so that you can fill it with butter, whipped cream and jam. Yum! Any skepticism I had about making biscuits from only two ingredients evaporated halfway through baking, when I went to rotate the biscuits and found they were raised, puffy, and emitting the most drool-inducing aroma. The finished product delivered on this promise: biscuits so incredibly tender, fluffy, and savory that you’d swear they had to contain buttermilk, or butter, or even lard. Because they’re small, you’ll want to pop them like candy, but try to resist so you’ll have some leftovers for the next day. The recipe worked exactly as written. I had to add a couple of tablespoons of cream to the dough because it was a bit dry, and it came together very well. I didn’t have to use all of the reserved flour for the work surface, as the dough wasn’t too sticky, and only folded it once since it held together pretty easily. Generally, the dough was nowhere near as sticky as the recipe led me to believe it would be. I got a yield of 12 biscuits and a couple of dough blobs (from dough pressed 1/2-inch high), and baked them in a 9-inch round cake pan. They baked for the full 14 minutes, and the results, as I said above, were blissful. Even though they’re called Beginner’s Cream Biscuits, they should be a staple for cooks of all levels who are looking for an unfussy, intensely satisfying biscuit recipe. These are easy and delicious, and although I had my doubts that any recipe with only 2 ingredients could be any good, I was wrong! They’re tasty, light, and very easy to spread butter or jam on. These would be perfect for summer shortcakes. I made them about an hour before we ate them, and they held up well—although the first taste out of the oven was sublime. For dessert servings, I’d use a bigger biscuit cutter. TIP: Be careful when putting the oven rack in the top position—in my oven, that’s VERY close to the top of the oven, causing the biscuits to rise considerably. One level lower worked perfectly, with no danger of them hitting the broiler above. I used a baking sheet with a Silpat and didn’t need to brush it with butter to prevent sticking. At 450 degrees, the butter will burn, and that could cause the biscuits to get too dark on the bottom before cooking, which the author warns against. These biscuits are the perfect version of what a Southern biscuit should be, without complication. They’re light, tender, and have a great rise. If you don’t have self-rising flour, you can make your own (1 cup of self-rising flour = 1 cup of all-purpose flour sifted with 1 1/2 teaspoon of baking powder and 1/2 teaspoon of table salt). I found the amount of salt to be perfect, but I tend to like things on the salty side—cut back if you don’t. First, I must say that I’m no biscuit snob. Though I’ve certainly had some biscuits in the past that I didn’t think were very good, when I have a biscuit, I tend to enjoy it. I’ve only bothered to make biscuits at home a few times. I can’t imagine a recipe being any easier than this one, and the final result worked well as a vehicle for rhubarb jam at a Mother’s Day brunch. Though mom wasn’t impressed at how high the biscuits rose, she did agree that they were much lighter, and more tender than they looked—and very tasty, to boot. I can’t claim to have the experience to rate this a great biscuit, but it’s a very good one, and is very easy to make. What a great recipe! It took longer to preheat my oven than it did to make these biscuits. With only two ingredients (although, if you make your own self-rising flour, there are four), and easy, detailed instructions, anybody can make these biscuits. I halved the recipe and got 5 biscuits that were a bit crumbly, but tender and tasty. My biscuits rose beautifully and were perfectly baked in 12 minutes. Around here, we all grew up on biscuits—so everyone has their secret recipe or ingredient. I think I’ll claim this recipe as my own secret—you know the kind: The “it’s an old family recipe I can’t share, or I’ll have to kill you if I do” kind of recipe. I hope everyone tries it—you’ll be baking biscuits for every meal, every day. And for shortcake, just add some brown sugar to suit your sweet tooth, and bake as directed. Again, a real winner. Thank you, Nathalie! This was, without a doubt, the easiest biscuit recipe ever. If more beginning cooks learned to make biscuits using this recipe, they wouldn’t ever turn to that can of pre-made biscuit dough instead. While I missed a bit of the buttery goodness that a more traditional biscuit recipe imparts, the title explains that this is a beginner’s cream biscuit. This biscuit should be taught to every grade-school child in America, so they know how to make this one American mainstay well. Biscuit recipes strike me with both longing and fear. What could be more homey than eating hot biscuits slathered with butter? Yet, I’ve tried many biscuit recipes and I’ve been disappointed a lot. I always fret that the ingredients aren’t at the right temperature, that I’m handling the dough too much, or that the biscuits won’t rise and end up as proverbial hockey pucks. But this recipe has put me on the road toward biscuit confidence. The dough came together using just the amount of heavy cream called for in the recipe, and it held together well—not too much unincorporated flour, yet not smooth like a bread dough. The use of the word “shaggy” by the author is a good description. A quick bake time had me enjoying light, tasty biscuits in less than 25 minutes. This recipe is about as simple as it gets: Two ingredients are mixed together to become magically light and flavourful biscuits. The recipe takes no time at all to put together. I chose to make the soft exterior version, which turned out so light and tender. The folding of the dough is almost like creating puff pastry, layer upon layer. I used the three-fold technique, and the biscuits were as light as can be. They’re heavenly with homemade jam. Quick and easy enough to make for a last-minute addition to dinner, or as a warm treat at breakfast on a weekend morning. Needing one more dish to round out a meal of barbecued chicken, I turned to this simple recipe. Your guests will think you were hard at work, when in reality, it took you about 15 minutes and two ingredients to make fluffy, light, and perfect biscuits. Notes: Watch the color carefully while baking, as these can go from light golden brown to overdone in minutes. In fact, I’d place them in the top third of the oven, not on the top rack. Additionally, my yield was only 8, but they did snuggle perfectly in an 8-inch round cake pan. And yes, the bottoms will benefit from a cookie sheet under the pan to keep them from browning too quickly. Just as Nathalie Dupree promises, this biscuit is a snap to make. It comes out very tender and very delicious. The recipe is written perfectly. The baking time was spot on, as well. Folding the dough over twice makes the biscuits easier to split open. I spoke to Nathalie about the recipe and she gave me some tips: 1) Use a very large bowl. This makes the mixing of the dough very quick, so you don’t overmix it, ensuring a tender biscuit. 2) The dough doesn’t need salt if you’re using self-rising flour. 3) If you can’t find White Lily or Martha White brands of flour, just decrease the amount of flour by 2 tablespoons to mimic Southern flour. Or, use self-rising cake flour, and you won’t have to decrease the amount of flour. I love this biscuit, and you will, too! I live in the South, so I love my biscuits. For the longest time, I was afraid to make biscuits because I’d heard so many horror stories of hockey pucks masquerading as a bread source. If this describes your experience, then wait no longer! This recipe is super simple, easy to understand, and make. The biscuits had a very tender crumb, and if you want to cut them in half, make sure to go for the thicker dough, or they’ll disintegrate when cut. I didn’t have self-rising flour, but I made my own. Also, I like my biscuits a little sweet, so I’d add 1 to 2 tablespoons of sugar in the future. Herbs and a dash of powdered mustard are also great ways to change up the flavor. I liked these biscuits, but have some caveats about the recipe. I’m always a little annoyed by recipe claims of two or three ingredients, when one of those ingredients itself has multiple ingredients. Just saying. To make the self-rising flour, I used the following: 2 1/4 cups bleached all-purpose flour, 3/4 teaspoon of salt, and 1 tablespoon of baking powder. I basically took these proportions from my old standby James Beard version of cream biscuits, which is essentially the same (but in my memory, easier to follow), right down to the way soft-sided or crispy biscuits are produced. That said, these were perfectly simple and quite light and tasty. I expected that, since I’ve made them for 40-plus years. Use a light touch when blending. I don’t think the “clumpy” instruction is necessary, but I guess if you had too little cream, you may need that as a visual to indicate the dough is too dry in spots. I made my biscuits giant-sized. I was intrigued by the suggestion that a half-inch biscuit and a 1-inch biscuit could both be baked for 10-14 minutes. It turns out that the 1-inch biscuits can’t. They needed another 4 or 5 minutes to cook through. I didn’t get the point of brushing them with melted butter and turning upside down. I prefer splitting and buttering each half, especially since the biscuits were really big. I used to dislike biscuits because the only times I had them when growing up was when my mom made them with a mix. They were terrible, with a distinctive and unfortunate flavor that was hard to ignore. This is a simple recipe, and the resulting biscuits are surprisingly light and tender, with a subtle flavor that won’t overpower whatever you choose to eat with them. This recipe is so easy to make, there’s no reason to ever use a mix. When I see my mother next, I intend on convincing her that this should be her go-to biscuit recipe. It’s as easy as the mix, and the results are significantly better tasting—and I’ll no longer have to claim that I’m on a low-carb diet when my mom serves them. Win-win-win. While this recipe is very simple, the results are delicious. I chose the crisp version, so I followed the suggestion to have space between them on the cookie sheet. One additional note about baking is that if you use a dark baking sheet, the biscuits will bake quicker. It really is important to rotate the pan during baking so all of the biscuits brown evenly. What I loved about the recipe is that you could serve hot biscuits at one meal and, if you had any left over, you could use the biscuits for strawberry shortcake. A great recipe that I’ll add to my cookbook. Easy peasy, baby! I can make and bake these biscuits while half asleep on a Sunday morning. I love that. These biscuits are airy, releasing a puff of steam when the crisp outside is broken. This makes them the perfect foil to mop up a dish with gravy or a creamy sauce. These biscuits paired beautifully with my custardy, small curd, scrambled eggs, and I was tempted to make sausage gravy because I just know this is the right biscuit for the gravy’s density. We love biscuits with our holiday meals, and the absence of shortening in this recipe lightens up the biscuits, making them perfect to serve with a buttery turkey and all of the holiday fixings. This recipe is a perfect example of why one never needs to buy a tube of dough in a grocery store ever again. With only two ingredients, a few minutes, and minimal fuss, you can have a pan of tender, soft biscuits that’ll please any biscuit lover. These were a revelation to me; with a very different, more delicate texture than my usual tea biscuits, and they’d be perfect as a base for a creamy chicken or seafood stew, or (with a little sugar added), a berry shortcake. The dough came together swiftly and tidily, without the “clumps” mentioned in the recipe, and the folding of the dough seemed to bring it together very well. I didn’t need to use the extra 1/4 cup of cream, and used only 2 cups of flour, with perhaps an extra tablespoon for rolling. When I make them again, I’ll add a bit of salt to the dough, and I’m not sure if I’d raise the oven rack quite as high, since my biscuits browned a bit too swiftly on the top. My yield after patting the dough to about 3/4-inch was 6 biscuits at 2 1/2 inches, and 3 freeform biscuit-objects (yummy, just not pretty) made from the scraps. Simple and delicious! Only two ingredients, and the self-rising flour does all of the work. Make sure you get the dough to the correct consistency, and be especially sure that all of the flour is moistened as you mix it with the cream. I had to use about 1 tablespoon of the reserved cream to get a wettish dough, as specified in the recipe. After mixing, my dough had a lot of clumps, but folding helped get a smoother consistency. Before shaping, I folded the dough three times. Baking time and yield were exactly as stated in the recipe. Easy Cream Biscuits Recipe © 2011 Nathalie Dupree | Cynthia Graubert. Photo © 2011 Rick McKee. All rights reserved. All recipes and photos used with permission of the publisher.